Celebrated novelist NK Jemisin is the author of The Inheritance Trilogy, The Broken Earth Trilogy, and The Dreamblood Duology. Her writing has won the Locus Award for Best First Novel and three Romantic Times Reviewer’s Choice Awards. Jemisin’s work has also received nominations for the Crawford, Gemmell Morningstar, and James Tipree, Jr. Awards, two nominations for the World Fantasy Award, three nominations for the Hugo Award, and four nominations for the Nebula Award. 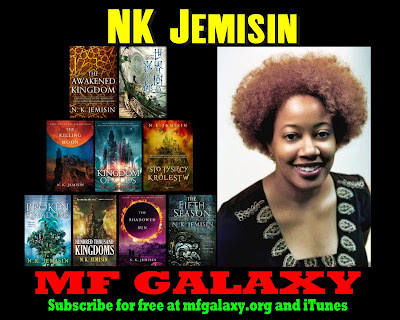 Along with Nalo Hopkinson and Nnedi Okorafor, NK Jemisin is one of the N3, a nucleus of highly influential contemporary writers of science fiction and fantasy. Jemisin is also well-known as a blogger on politics, feminism, and racism; in what writers would call a “day job” and what others would call a full-time career, she’s a counselling psychologist. Jemisin spoke with me by Skype from her home in New York City on January 24, 2015.